The Global Digital Marketplace aims to help international governments make their procurement more transparent, and to boost their digital, data and technology sectors. It builds on the success and expertise we have gained through the Digital Marketplace in the UK. We’re working with national and regional governments in South Africa, Mexico, Colombia, Indonesia and Malaysia. We’re now in discovery, researching the digital procurement landscape in those countries. The aim is to figure out the most useful work to do in the next phase of the project, and – ultimately – to help tackle corruption globally. Warren Smith blogged about what GDS is doing in this area in January. Our team has about 20 people, from GDS and 5 supplier partner organisations. While that might sound like a recipe for mayhem, the project was set up this way on purpose. Here’s why. The GDS team wasn’t big enough to do the discovery on its own. We could have looked for a supplier to help, but the global scope and timing of the work probably would have limited bidding to large organisations, and we were concerned about being dependent on a single large supplier. We also wanted to open up opportunities to a broad range of potential partners. We were also hoping to find specific and relevant expertise, and of course to get maximum value for the contracts. To do those things, it was important for bidding to be open and competitive, and not limited to big, global organisations. The solution was to break the discovery into smaller chunks, and enable suppliers to bid for each of them. This opened up the bidding to small and medium-sized enterprises (SMEs), and 4 were awarded the contracts: Rainmaker Solutions, Caution Your Blast, dxw digital (who partnered with Oxford Insights), and Spend Network. Each supplier has to deliver a specific outcome, and all the outcomes have to add up to a coherent discovery outcome. This felt pretty daunting – none of us had experience with working as part of this kind of team before. We decided to approach it as an experiment to see if we can make multi-supplier delivery work. So far, our discovery has shown us that it is possible to bring people from different organisations together to operate as one team. Even if they and their organisations have different remits. But, unsurprisingly, this way of working needs to be approached differently from working as part of an in-house team. Each supplier team will naturally be focused on their own outcome, because their success will be measured against it. Therefore, our goal was to encourage them to focus on the overall outcome of the programme and to foster positive relationships between the different supplier teams. We did this by making sure that each team understood what the others were doing, and also through organising social activities, so that we could get to know each other better. Breaking the work into smaller, themed chunks helped us find expertise, even in areas where we didn’t expect to find it. 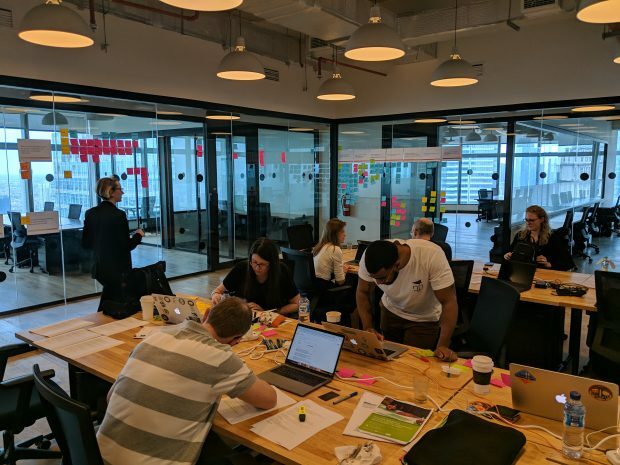 For example, Spend Network is a specialist in open data and contracting, while Rainmaker has a strong presence in South Africa and is using it to support the discovery work there. The team is stronger for it. When working as part of a multi-supplier team, you need to balance the need for central oversight of the work with the different suppliers’ ability to decide how they deliver their outcomes. And this is hard to get right. One example of this is the backlog: we have several – a central one and others that the suppliers maintain. Trying to merge or align them just hasn’t been practical, but it means there’s no place with a complete view of the team’s work. We’re continuing to look for a better solution to this one. Another example is how we manage user research. Early on in the discovery, we decided that we wanted to have a common approach to research – use the same consent form, log our research participants and our findings in the same way. Essentially, we wanted to have common standards so that each team could quickly grasp what another team had found. The suppliers we work with relied on the programme team to make that happen. This initially put a lot of pressure on our internal researchers, who could not dedicate as much time to their own research. We are now much better at delegating tasks. We’ve already noticed the supplier teams supporting each other during the overseas research trips – through highlighting findings relevant to other teams and ensuring a consistent engagement with our stakeholders. Naturally, there are dependencies and overlaps between the suppliers’ work, and these are high risk – it’s easy to end up with two groups doing the same thing, or something falling between the cracks. To address this, we’ve run workshops focused on overlaps, and we have a wall in our team area dedicated to visualising them. For each overlap, we decide collectively how we are going to manage it. For example, if 2 research teams want to interview the same participant, they decide whether they can team up or not. If they are going to run separate sessions, they decide how they will manage the participant’s expectations – making sure the participant understands why that’s the case and that they’re not asked the same questions twice. Obviously, someone needs to facilitate the work of the team, and look at and manage the overlaps between the work of the team members. But we’ve also found that the most important central function is setting clear goals and constraints, and keeping a focus on the overall outcome. This central role on our team is assigned to a product manager. 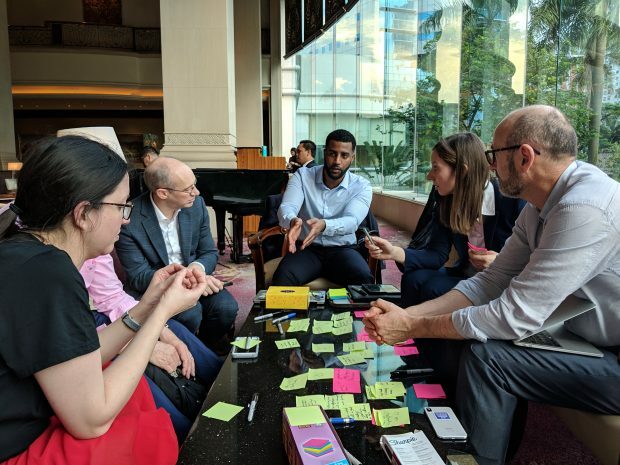 This is still a work in progress – our team is in Malaysia this week, and South Africa next week. The results so far are encouraging, though, and we’ll be back soon to tell you more about what we’ve found in the discovery. In the latest episode of the GDS podcast, senior writer Sarah Stewart talks to Minister for Implementation Oliver Dowde.